A bridge is made up of two or more crowns for the teeth on either side of the gap, these two or more anchoring teeth are called abutment teeth and a false tooth/teeth in between. These false teeth are called pontics and can be made from gold, alloys, porcelain, or a combination of these materials. Dental bridges are supported by natural teeth or implants. Process for Getting a Dental Bridge? During the first visit for getting a dental bridge, the abutment teeth are prepared. Preparation involves re-contouring these teeth by removing a portion of enamel to allow room for a crown to be placed over them. Next, impressions of the teeth are made, which serve as a model from which the bridge, pontic, and crowns will be made by a dental lab. Your dentist will make a temporary bridge to wear to protect the exposed teeth and gums while the bridge is being made. 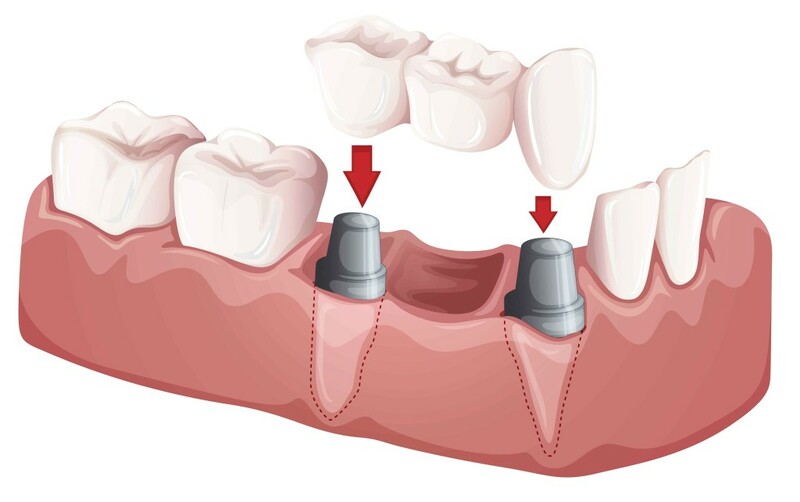 During the second visit, your temporary bridge will be removed and the new porcelain or metal bridge will be checked and adjusted, as necessary, to achieve a proper fit. Multiple visits may be required to check the fit of the metal framework and bite. This is dependent on each individual's case. If the dental bridge is a fixed bridge, your dentist may temporarily cement it in place for a couple of weeks to make sure it is fitting properly. After a couple weeks, the bridge is cemented into place.